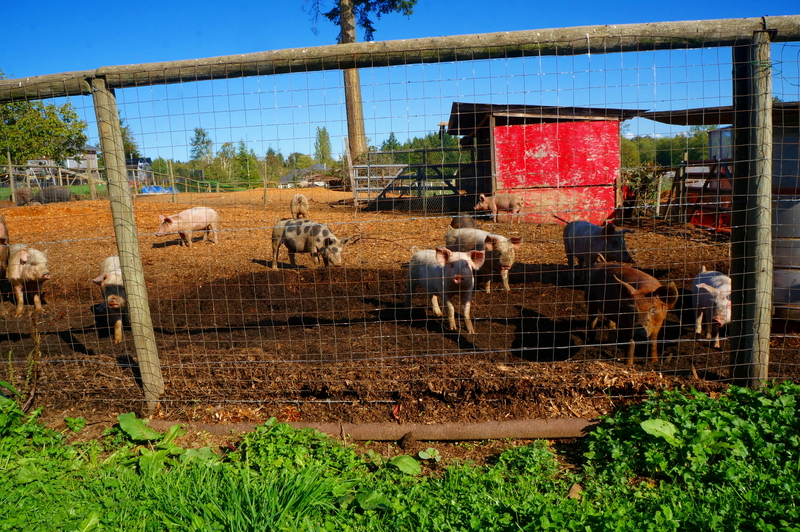 I went out to Aldergrove to buy a pig. 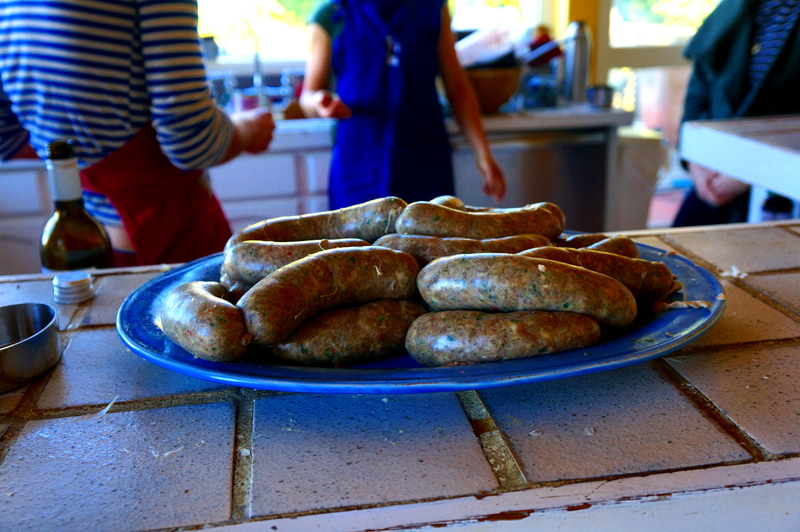 I was looking to add meat to my winter meals, have a say in how that meat is raised, and host a sausage-making workshop for my friends. I found Jamie Shaw of Shaw Family Farms on craigslist. 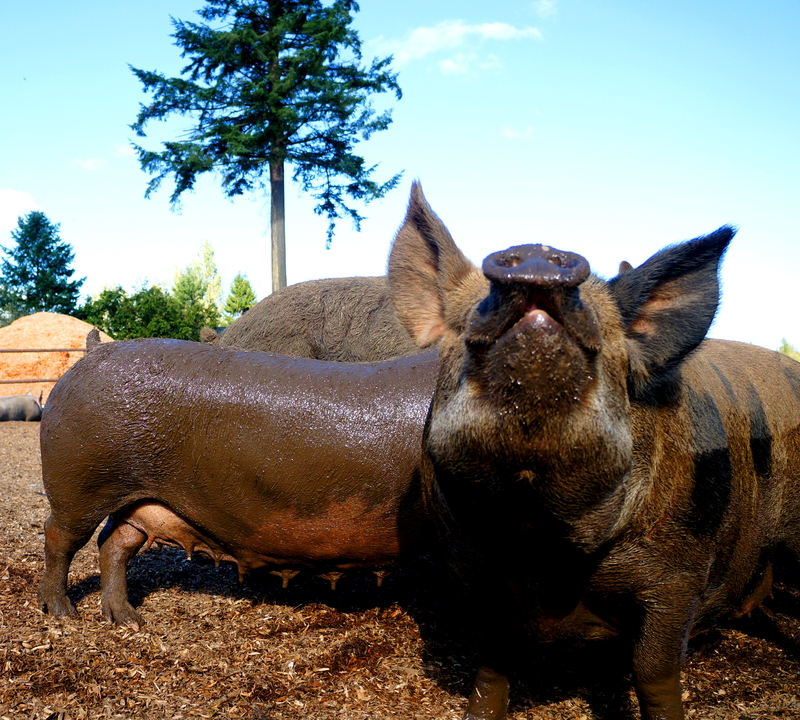 I was sold by the photo of the pigs wallowing outdoors in fresh vegetables. Also the price was about 2/3 of what I’ve been paying at the farmers market. The farm was really beautiful, and the fella met me with a big smile. The pigs were pretty cute, I’ve got to be honest. I was happy to see how much space they had. And how many friends! Pigs, chickens, turkeys (look at those suckers!) and a cat, living together. The pigs were sweet. Mom and dad were getting tender when I arrived. 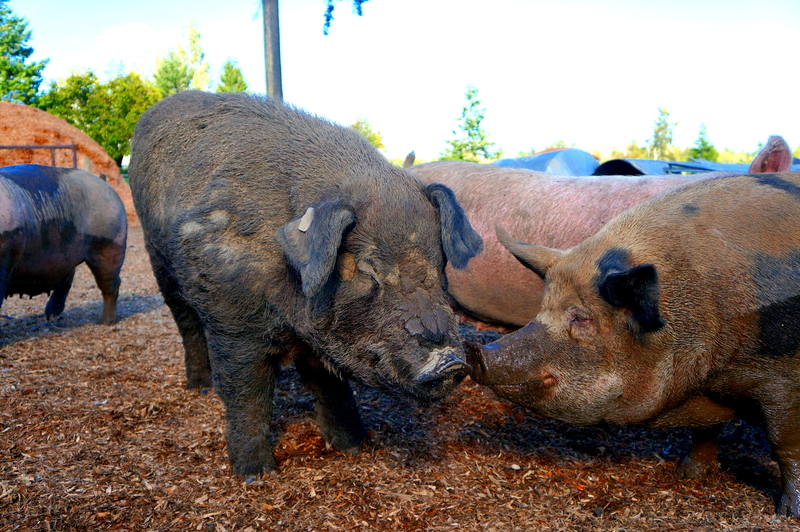 Gotta watch yourself around these guys — they’re a deceptive 800-1000 lbs. They’ve got a big open space to roam, and a deep pool to wallow in. 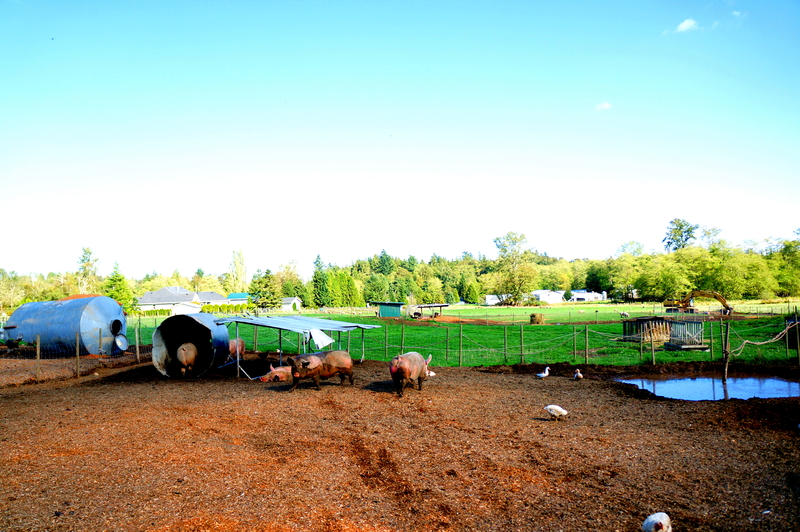 The pigs go inside for 5 weeks to give birth and grow, then out to the field. It was a weird experience going to the kill & packers. It was done at Johnston’s Packers in Chilliwack. Its a government certified facility, and on a “pig day” they kill and cut 700 animals. In the 10 minutes I was inside, I saw about thirty smiling but desensitized people in white, red-stained outfits. It smelled of cold ground beef. I didn’t go to the killing floor, and decided not to take any pictures. But I ended up with my half-animal wrapped in plastic in the back of my car. 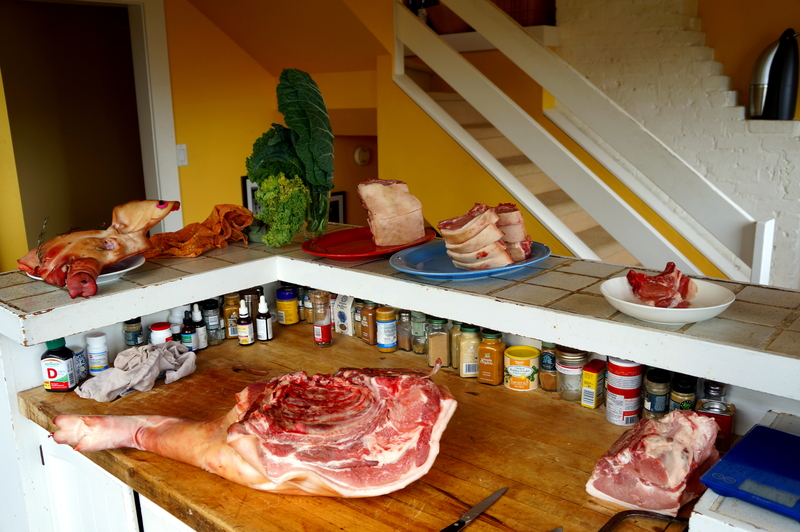 Butchering: when friend becomes food. It was unusual to have a big, dead animal on my counter. Can I respect it like an animal while I look at it like food? But with a little enthusiasm, a little care (for the animal and myself) and some help from youtube, I got the job done. The squeamish among you can ignore the head. Yep, (friends &) I ended up with a lot of meat. What I really received, though, was adventure and a connection to what feeds me. Awesome! Shaw Farm is the best!